A viral comic strip offers both quotidian charm and transcendent wisdom. This “amusing alien outsider” trope has been utilized in other pop culture forms, from television (3rd Rock from the Sun, Mork & Mindy) to film (Coneheads). The comic strip Mr. Skygack, from Mars, which ran from 1910 to 1917, could be considered a precursor to Strange Planet. In his contemporary rendering of this conceit, Pyle achieves a delicate balance between satire, parody, and irony—all wrapped up with the utmost simplicity. The comics’ blue-and-pink color palette and hand-drawn aesthetic are all condensed into four squares of subversive delight. It’s charming precisely because it’s so simple and easily grasped, almost childlike in its wonder and style. Yet each new comic offers rich observations about the beautiful absurdities of quotidian existence. There is a wisdom to be found here. Which brings me to the genre of parable. The parables of Jesus are also observational short stories and metaphors about the mundane aspects of life, specifically life in first-century Palestine. Pithy and earthy, Christ’s parables were revolutionary precisely because of their surprising simplicity and openness to interpretation. The word parabolē in Greek—from para, “alongside,” and bole, “a throw”—literally means “to come at or strike from the side.” It’s an indirect attack, suggesting being blindsided or sucker-punched, breaking through an audience’s emotional and logical defenses via its subversive form. With a parable, we are drawn in by the simplicity of the story, only to the have the theological rug pulled out from under us. Philosopher Paul Ricoeur says the logic of the parable genre is “the extraordinary within the ordinary” or “the fantastic of the everyday.” Parables aren’t myths or fables or allegories—they’re ostensibly secular narrative-metaphors which confront us with the transcendent via the immanent. A surface reading may elicit brief amusement, but a deeper dive teases us into contemplation that may unearth divine wisdom. “The fantastic of the everyday.” That’s something like aliens requesting “mutual limb enclosure” when feeling sad or enjoying sipping thousands of sucrose crystals added to hot leaf water. Through the cutesy beings of Strange Planet, we begin to see our everyday practices—playing video games, living in apartments, eating waffles, having babies—with a new, upside-down vision. We’re teased into thinking deeper about our world, to take notice and pay attention not only to the what but the why of our existence. Could it be that Strange Planet is parabolic—alien parables inviting us to not just giggle, but also consider our own brokenness in the midst of the glory of God’s good world? The comic riffs on surprise parties’ absurd premise: we prove our love and loyalty to others by lying to them, banking on the hope that our secret celebration might relieve their disappointment. It’s funny, but it also points out our inherent relationality as human beings, our innate desire for love and community, and the value of truth in a world of deception. Surprise parties are inherent paradoxes: they are acts of care based on uncaring actions. So why on Earth do we do this sort of thing to ourselves? Tradition? Sinfulness? Liturgy? All of the above? These are the kinds of questions Strange Planet can provoke. Its goofy depiction of surprise parties and other human behaviors raises deeper considerations to the surface, questions about our fallenness and goodness, our depravity and the imago dei. This is precisely what Jesus was doing with his parables—he was revealing the depths of reality via his ordinary-yet-extraordinary story-metaphors. 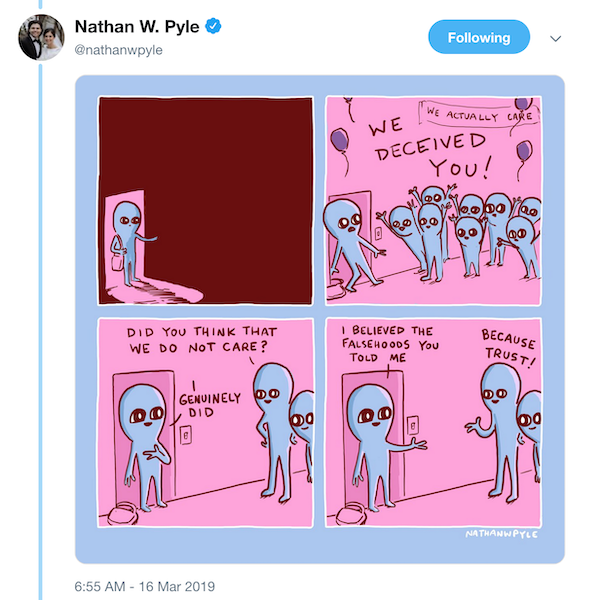 I find it intriguing that Nathan Pyle’s Twitter bio says, “I follow Jesus,” the same Jesus who was the ultimate alien outsider inviting us to see all things anew. So, may you imagine pleasant nonsense and receive all the star damage you crave, believing the falsehoods I have told you. Because trust!